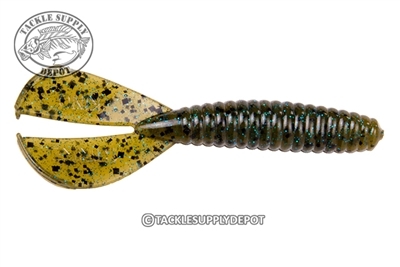 The Strike King Rage Tail Twin Tail Grub works great for flipping, as a jig trailer or on a jig head. With two Rage Tail flappers it can be rigged vertically or horizontally and is one of the best swim jig trailers on the market. Each Rage Tail lure has a unique and exclusive Tail design and is engineered like no other soft plastic bait. Each is designed with a specific purpose and uses customized hi-grade plastics for superior action. All Rage Tail baits are packaged in individual clam shell packages to hold its shape until use. This means higher quality and NO deformed bodies!! Your picture of the glacier color looks white with gold flake and it is not , it is clear with blue flake. you need to make a note or change the picture. Everything else was ok, but I was unhappy to buy something I did not want because of a catalog mistake.